Foster, Rich & Ann Costello, Kevin & Amy Smith, Andy & Jen Held, Mr. & Mrs. Bill Steinberg, P.E.O. 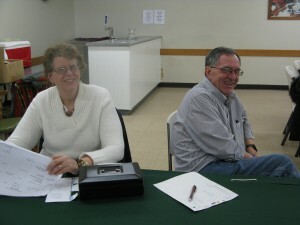 Chapter IX, Jerry & Marsha Greenstreet, Edgar & Karen Huffman, Werner C. Stichling & Associates, The Lowry Law Firm, Kelley & Joe Vollmar, and Cristy & Steve Heuer. Tiffany served as our "Vanna White" for the silent auction. 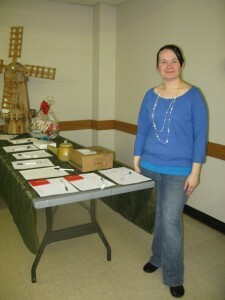 A wonderful variety of local articles were for sale for the live and silent auction. Donations were received from the following market vendors: Scrub Oak Forge-Bob & Bryanna Alexander; Terry Eiler; Turtle Ridge Carving-Tim Gagnon; Ray Underwood; Dawna Watkins; Dr. Lee Eavy; Barb Marco; Julie Ott; Padra’s Gallery-Bob Payne; and Margaret Pillen. Community business donations were also received from: Fountain City Grille-Kevin & Amy Smith; Lorenzo’s Italian Kitchen-Vito & Alyssa Chirco; Auto Zone; Hallmark Store & Metro Office Supply-Linda & Chris Hagen; The Giggle Box-Mr. & Mrs. Jerry Appleton; Werner C. Stichling & Associates; Drummond Florist; Hamel & Rowe Hardware; Sun Ray’s Tanning & Hair Salon. The evening activities were organized and facilitated by Pat Hay and her crew of volunteers: Bruce King; Jillian Lutz; Jared Lutz; and Sean Hay. 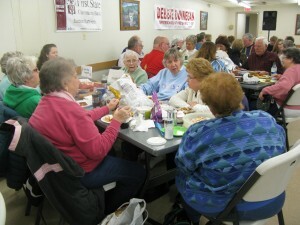 This group of volunteers did an excellent job of executing the event in a professional manner. Other volunteers included: Charles Campbell, Jim Foster, Bob & Darlene Payne, Bruce & Cindy Valle, Tiffany Wymore, Charlie DeClue, Claudia Lawrenz and Dawna & Xanthus Watkins. Special thanks is extended to the Knights of Columbus Hall for allowing us to host our event on their premises and especially to Ray Choate for his attention to detail and Charlie DeClue for tending bar and making sure that all of our guests were taken care of throughout the evening. Working in this community is a pleasure. 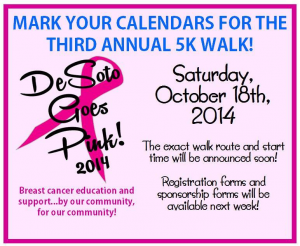 Get Healthy DeSoto appreciates the generous support of the De Soto community. Proceeds from this event in the amount of $3,470.32, are designated to pay for DFM operating expenses. Thank you to all who participated. Oh, and the winning team: Werner Stichling’s! With fall comes beautiful weather…weather that makes strolling through the parks or sprinting through the streets (not to be confused with flashing) so much more enjoyable. There are several opportunities coming up that allow you to do that and to raise money for local organizations too. Here’s some brief information about what’s in store. 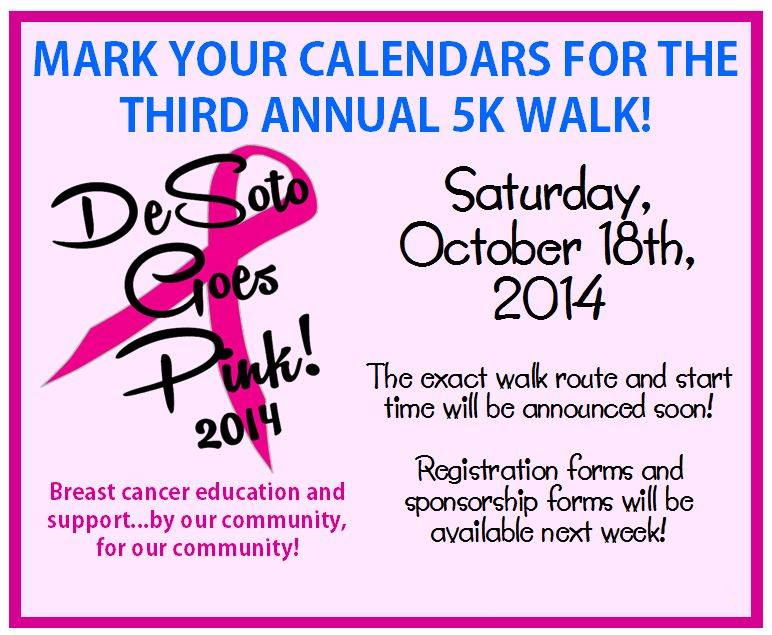 The 2014 DeSoto Goes Pink 5K will be October 18th at Spross Park. You can check out their Facebook page or click on the link below for the registration form. Funds raised go to assist those who are battling breast cancer by providing free or low-cost mammograms, gas cards, help with utility bills, and other assistance, primarily to those who don’t qualify for other programs. And you guessed it, the money is used locally! The 2014 Vineland 5K will be November 1st. The purpose of the race is to promote a healthy lifestyle while raising money for Angie’s Hope Foundation, which is a local scholarship program. You can contact Amanda at the school (636-586-1010) for more information or just get the registration form using the link below. Other races abound too, but these are local. If you want something that will provide a little drive and change in scenery, you might check out a Turkey Trot (11/27/2014) or the Making Strides of St. Louis (10/25/2014). Poinsettias were first introduced in this country in 1928. Today they are grown in all 50 states. Over $220 million worth of poinsettias are sold during the holiday season. The first American Christmas Tree wasn’t a tree at all. It was a wooden pyramid covered with evergreen boughs and decorated with apples. Today more than 35 million Christmas Trees are produced each year. The holiday season is the busiest time of the year for the postal service. Last year over 20 billion cards, letters and packages were sent during this time.